Hayes & Yeading overcame their first hurdle in this years’ Emirates FA Cup with a single goal victory at the SKYex against Hellenic Premier Division side Brimscombe & Thrupp with substitute Manny Duku netting the winner in the 77th minute. Manager made 7 changes from the side well beaten at Marlow in midweek in a starting XI that saw debuts for Gurkan Gokmen, Rowan Vine, Alex Atkinson, Orlando Rodrigues and the return after 6 years of midfield general Phil Appiah. The others coming into the starting XI were Rohdell Gordon and Spyros Mentis. The opening chance of the game fell to the visiting Lillywhites after 12 minutes, Rodrigues was caught in possession outside the United box by Jack Smith, his centre was headed goalwards by Sam Blackie, only to be blocked away as far as John Evans who fifteen yards from goal let fly only to see his shot blocked by an excellent Mat Mitchell-King interception. 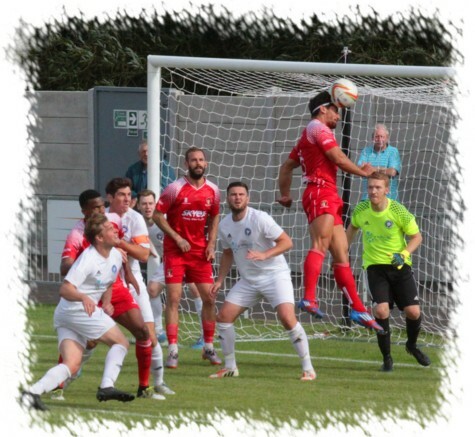 United were quickly on the attack themselves earning a corner kick that was fired in by Alex Atkinson, Spyros Mentis meeting the ball with a glancing header that was booted off the line at the far post by a well placed defender. Another chance soon fell to Blackie of the visitors, the striker turning his marker on the edge of the box but United stopper Jack Smith was equal to his effort, blocking then grabbing the loose ball inside his six yard box. With half hour played Mentis and Atkinson exchanged passes on the edge of the box, the latter clipping the ball over the defence to Vine who fired a header just the wrong side of the upright and then with a couple of minutes left to the break Vince crossed low from the left, a sliding Mentis at the far post only just failing to connect and the sides went in all square at half-time. The second period started at a slow pace until the introduction of striker Manny Duku from the bench just before the hour mark, this change by Paul Hughes really pushing United forwards at pace. Five minutes after coming on Duku laid off a Gurkan Gokmen centre from the right to Mentis who saw his sweetly struck drive pushed away by Brimscombe stopper Ashley Gale. Duku then set up Vine who saw his effort deflected over by a well timed Elijah Simpson interception before Mentis sent Duku away on goal only for the striker to be tripped in the area by Kyle Pitts with referee Small pointing straight to the spot. Vine took charge of the kick only to see his effort saved by a diving Gale. 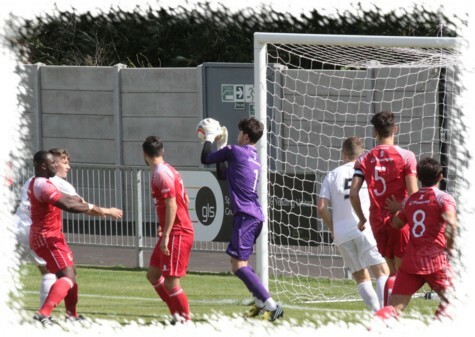 The Lillywhites were immediately on the attack from the save, Jack Smith crossing from the left to substitute Tom Black who saw his header caught by United’s diving ‘keeper, Jack Smith. Almost immediately United did take the lead. Orlando Rodrigues receiving the ball in the right-back position, his perfectly weighted ball down the line to Duku saw Gale start out from his goal before starting a retreat too late as Duku fired the ball home perfectly from the side of the box with Gale grasping at thin air in an attempt to keep it out. Three minutes later Duku had a clearer chance to double United’s lead only to screw his shot wide of the target and then Mentis collected the ball on the edge and tried his luck only for his effort to be glanced over by the head of Pitts. No more real goal chances came although the visitors Ollie Pitt did receive a second yellow card in stoppage time and was dismissed much to the delight of the United fans in the stand who had seemingly been the recipients of an obscene hand gesture from the same player earlier in the game outside of the gaze of the officials. United Man of the Match: Rowan Vine.